Trinity Earns $61K Thanks to You! Did you know that your investment and savings plans can earn Trinity thousands through LECF’s Shared Blessings Rebate program? Trinity just received a check for just over $61,000 from LCEF to assist our ministry! 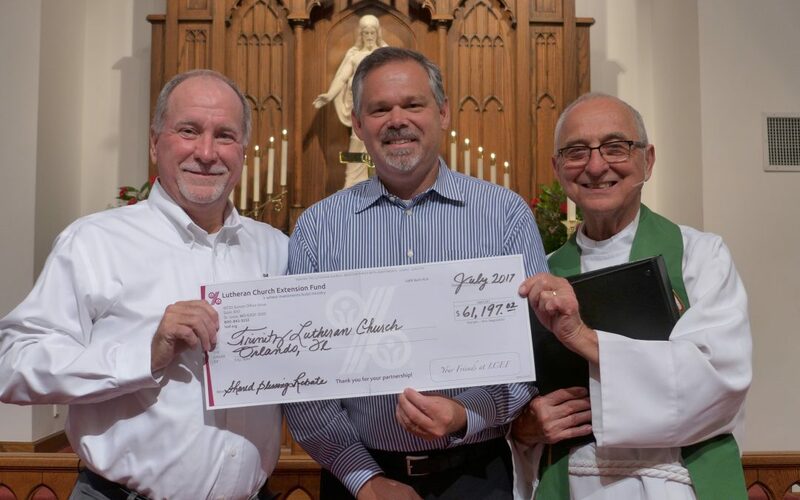 The check is the result of the outstanding response from Trinity’s Church & School families to open an account with LCEF! If you haven’t already, please consider opening an LCEF savings account. The more investors mean the higher the rebate check will be next year. Savings account investments start as low as $25 for children under 18 and $100 for adults. If your child is new to Trinity Lutheran School’s CDC or K-8 programs, Trinity will donate $25 to start the account. Adult investment accounts with LCEF benefit Trinity in the same way the Youth Investor accounts do, so TLS parents and church members, you can participate as well! You can apply online at LCEF.org. LCEF’s StewardAccount is an easy-access investment that builds over time with interest earned. With your StewardAccount you’ll maintain full control over your balances and enjoy convenient online access through MyAccount. Contact Bruce Hahn at 407-701-3234 or email bruce@mm-c.com.